OutBox Media is organizing Baby Blast 3: It's More Fun with the Family activity this Sunday, 10am-8pm at The Trinoma Activity Center! 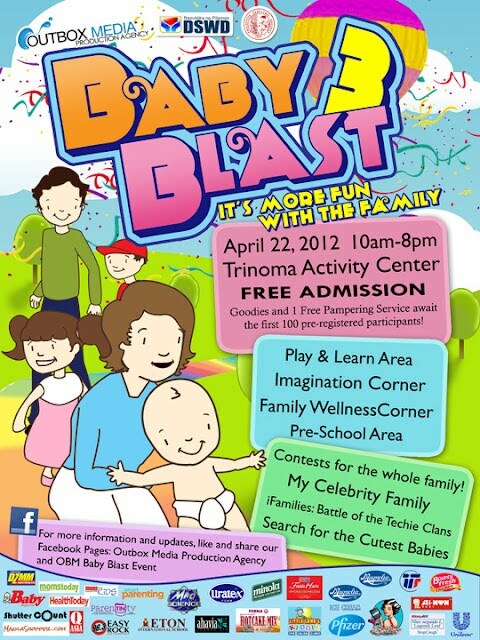 You can still come and enjoy the event since they have tons of games and surprises for all kids, Mommies and Daddies! This Sunday would surely be a whole day of fun learning, contests, entertainment and freebies for the whole family! "Baby Blast 3: It's More Fun with the Family" will be hosted by celebrity Moms- Christine Jacob-Sandejas, Cristina Gonzales- Romualdez, Valerie Bariou- Bondoc, Christine Bersola-Babao and Celebrity Couple- Aubrey Miles and Troy Montero. There will be special performances by: The Velasco Brothers, Aliya Parcs and Luke Mejares.